In Bitcoin‘s early days, you could easily mine the cryptocurrency on your own PC. But now you need cheap electricity and a serious investment in specialized hardware to have any hope of making money. It’s impossible to make money mining Bitcoin on your computer, even if you have a decent graphics processor (GPU) optimized for gaming. Anything that promises to mine Bitcoin with your CPU is a scam, as it won’t even be worth the cost of electricity. Mining has become more difficult over time, and is only becoming more difficult as times goes on. The Bitcoin network is designed to produce a valid “block” for the blockchain about every 10 minutes. Any Bitcoin mined is a reward for producing these blocks. The more hardware power being thrown at Bitcoin mining, the more difficult it gets to mine Bitcoin. You can see exactly how much the mining “difficulty” has gone up over time on websites like Bitcoinity.org. According to their data, it’s now 356 times more difficult to mine Bitcoin than it was five years ago. And, as if the mining difficulty going up wasn’t bad enough, the reward for mining is halved every 210000 blocks, which is approximately every four years. You can’t really go it alone, either. You’ll want to mine as part of a “mining pool,” which combines your mining power with other people’s and shares the resulting profits between all of you according to the hash power you bring. There’s generally a fee, like 1% of your profits, that you have to pay to be part of the mining pool. 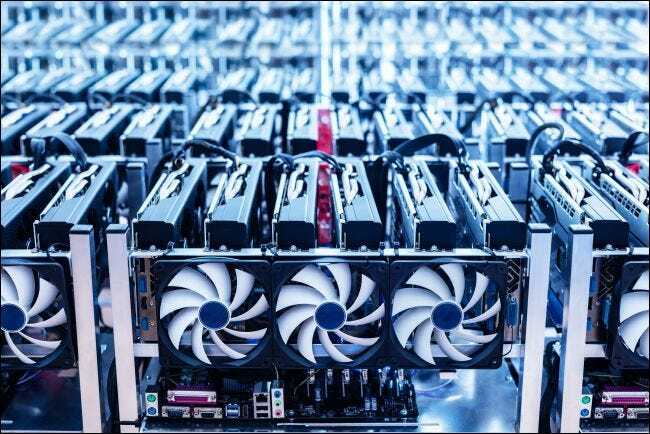 The people actually making money mining Bitcoin—or even just trying to make money—aren’t using desktop PCs or even powerful graphics processing hardware meant for gaming PCs. Instead, these people are using dedicated hardware optimized specifically for mining Bitcoin. These hardware devices are known as Application Specific Integrated Circuits (ASICs). This distinguishes them from CPUs and GPUs, which are general purpose computing devices that can perform a lot of tasks. ASICs are specifically designed to be as efficient as possible at a specific application—in this case, mining Bitcoin. RELATED: Can You Really Make Money Mining Bitcoin With Your Gaming PC? ASICs aren’t just faster at mining. They also use much less electricity while doing it. This is particularly important, as Bitcoin mining requires so much electricity and the cost of electricity cuts into your profit margins. 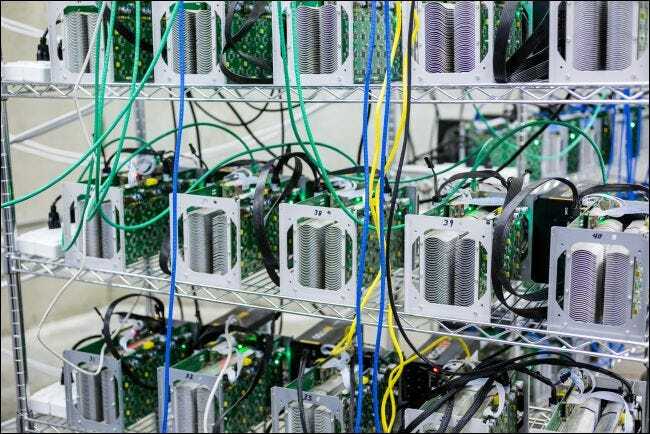 For example, the Bitmain AntMiner S9 is an ASIC has a hashrate of 13 Th/s—that is, 13 trillion hashes per second. As Bitcoin Wiki notes, people don’t even bother tracking the Bitcoin hashrate of modern graphics processors because ASICs are so many times more efficient. Even in 2014, ASICs had a hash rate more than 1000 times faster than a GPU. The Bitmain AntMiner S9 will cost you over $1000. And these devices don’t last forever either—companies like AntMiner are always improving and releasing new versions of their ASICs. As faster ASICS join the network and add more hashing power, older ASICs in use become less profitable. This leads to a sort of arms race—you have to upgrade your ASICs to stay profitable because other people are upgrading theirs. Modern GPUs just can’t profitably mine Bitcoin. People who are mining cryptocurrency with GPUs are generally mining altcoins with software like Nicehash—and even that won’t make you much money with desktop GPUs, in our experience. When you think about it, Bitcoin mining is really just the process of converting electricity into Bitcoin. To mine profitably, you need cheap electricity. That’s why China took the lead in Bitcoin mining, as some areas of the country could offer power as cheap as 4 cents per kWh. That’s quite low compared to the average price of 12 cents per kWh in the USA. If you’re paying more for electricity than your competitors are, you’re competing at a disadvantage. For example, let’s say you spend $1200 on an AntMiner S9. This device uses 1300W of power, which is 31.2 kWh per day. At an average cost of 12 cents per kWh in the USA, that’s about $3.74 in electricity costs per day per AntMiner you’re running. A calculator like the one on CryptoCompare.com calculates that you’ll make $3.63 per day in profits after these electricity costs are taken out. So, over a year, you’ll make $1324.12 in profit. However, you spent $1200 on that AntMiner, so you really only made $124.12 per AntMiner in your first year. That’s assuming Bitcoin stays at around $8000 in value and doesn’t drop any further, and that the mining difficulty doesn’t increase—which it will. You also can’t just use the same ASIC forever, as your profitability will go down over time. And, if you lived somewhere hot, you’d have to spend money cooling the place where you run your ASICs so they don’t overheat. On the other hand, if you’re paying 4 cents per kWh instead, you’re looking at a projected profit of $6.10 per day after electricity costs. That’s $2224.89 over the first year, or $1024.89 after deducting the $1200 cost of the ASIC. While things could still go wrong and you could fail to make a profit, there are much greater odds you’ll make some money. Your profits live or die by electricity costs. For example, if you pay 20 cents per kWh, as is the average in the UK, you’ll make about $1.10 a day after electricity costs. That’s about $400 per year, so it will take you two and a half years to pay off your AntMiner—and mining difficulty will increase, so there’s a good chance you’d end up losing money on that purchase. The people really making money are located in areas with cheap electricity, have a large number of ASICs, and have a good way to cool them that doesn’t use too much electricity. So, to make some real money, you’ll need some serious startup capital to buy all those ASICS and buy or rent land where you have cheap electricity. Average people can’t just make money mining on their home computers anymore. Image Credit: SPF/Shutterstock.com, Arina P Habich/Shutterstock.com, PHOTOCREO Michal Bednarek/Shutterstock.com.